Even kids can learn about the underwater world of the Caribbean, with a variety of PADI® programmes developed to teach them about scuba diving and preserving the underwater environment. 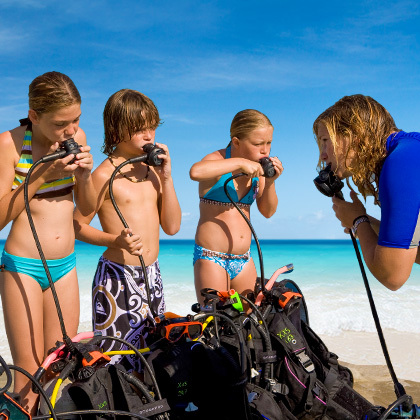 Kids Scuba programmes are available for an additional cost. What a great way to introduce children to scuba diving in a pool in less than six feet of water. Celebrate a birthday by throwing a memorable, exciting Bubblemaker party with friends and family at your local PADI dive shop or resort. It's fun, easy and safe. Experience what scuba diving is like under the direct care and supervision of PADI instructors. Take their first breath underwater. Children use all the basic scuba gear which is made for their size and stature. 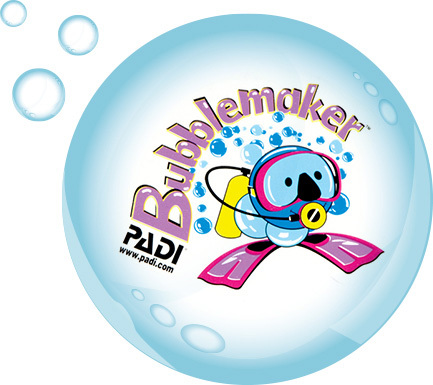 Check with your local dive shop about setting up a Bubblemaker today. Ready to blow bubbles? 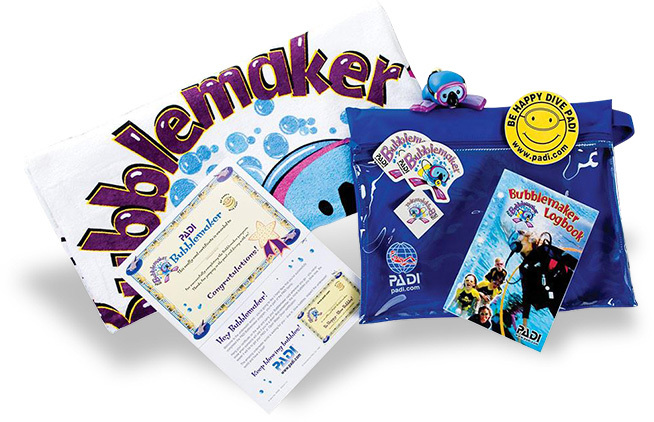 The Bubblemaker crewpak gives kids a memento of their visit to the underwater world and is full of fun surprises. The pack includes: a kid-sized beach towel, log book, certificate, temporary tattoo emblem and the adorable and a popular Bubblemaker "action figure." Kids who crave adventure and excitement (and what kid doesn't?) will get their fill of thrills in the PADI Seal Team Programme. In this action–packed course, children 8 years of age and up take part in a series of AquaMissions, led by trained PADI professionals, where they learn how to dive with flashlights, master underwater photography, float like an astronaut and so much more! It's hard to imagine anything better than gaining a whole new set of skills, getting a priceless education about the underwater world, learning about safe diving practices and having an absolute blast at the same time. 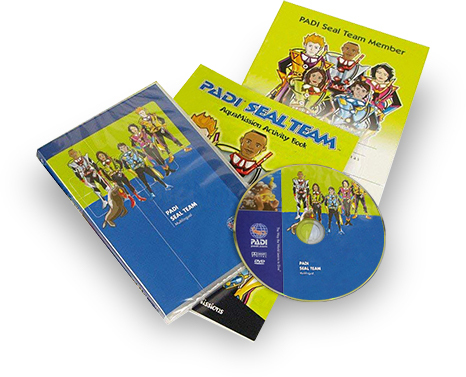 The PADI Seal Team offers your kids all of the fun they could ever want, while also teaching them invaluable lessons about safety and the sea. Learn the basics of diving on the first set of five AquaMissions. Go on more advanced and fun-filled AquaMissions, after completing the initial five. Take advantage of the incredible knowledge and experience of our PADI-trained professional staff. 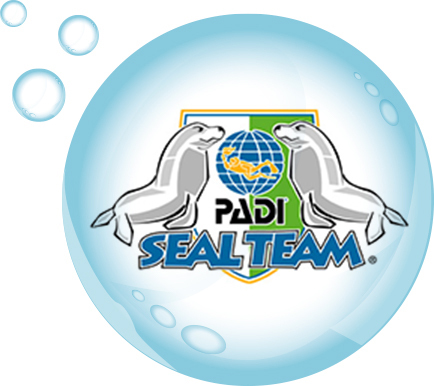 Seal Team participants use diving equipment that has been specially designed for kids, in order to fit their size and stature and make sure that they are as safe and comfortable as possible. Kids can get ready for all the awe-inspiring experiences that they'll enjoy on their AquaMissions with this state-of-the-art Seal Team Crewpak! Featuring a DVD, an Activity Book and Log Book Pages, this crewpak will have young Seal Team recruits up and ready for their missions in no time. Imagine a programme that teaches kids about the importance of protecting and preserving the underwater environment, while simultaneously introducing them to all of the beauty and wonder that the sea has to offer. Project A.W.A.R.E. does just that and so much more, plus, in the process, giving your children the experience of a lifetime! By learning hands-on ways to help safeguard the planet's oceans, kids can feel like genuine superheroes rescuing and protecting a universe that lives beneath the surface of the sea. 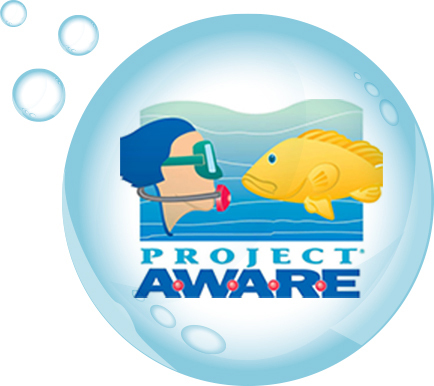 Through the incredible Aquatic Book, AWARE Kid Teacher's Guide and DVD, young environmentalists gain all the information and tools they need to help save the day! Find out about aquatic missions that encourage them to participate in shoreline cleanups, water conservation and recycling. Discover a whole new world filled with coral reefs, whales, sharks and so much more! Qualifying bookings will have the option to "hold the room" for only $98pp. If you select the "hold" option, the credit card used for the deposit will automatically be charged an additional $302 in 21 days. The total remaining balance of your holiday will automatically be charged 45 days prior to check-in date. Our Best Price Guarantee allows you to feel certain that the room rate you receive is the best price for your Beaches vacation. You can book with confidence online, through your favourite travel agent, or by calling 0800 022 3233. If within 24 hours of booking your online holiday at www.beaches.co.uk, you find a lower price for the same arrival date, number of nights and room accommodation we will refund the difference.